Authors: Cai, X.; Sushkov, A. B.; Suess, R. J.; Jadidi, M. M.; Jenkins, G. S.; Nyakiti, L. O.; Myers-Ward, R. L.; Li, S.; Yan, J.; Gaskill, D. K.; Murphy, T. E.; Drew, H. D.; Fuhrer, M. S.
Abstract: Terahertz radiation has uses in applications ranging from security to medicine. However, sensitive room-temperature detection of terahertz radiation is notoriously difficult. The hot-electron photothermoelectric effect in graphene is a promising detection mechanism; photoexcited carriers rapidly thermalize due to strong electron–electron interactions, but lose energy to the lattice more slowly. The electron temperature gradient drives electron diffusion, and asymmetry due to local gating or dissimilar contact metals produces a net current via the thermoelectric effect. Here, we demonstrate a graphene thermoelectric terahertz photodetector with sensitivity exceeding 10 V/W (700 V/W) at room temperature and noise-equivalent power less than 1,100 pW Hz^(–1/2) (20 pW Hz^(–1/2)), referenced to the incident (absorbed) power. 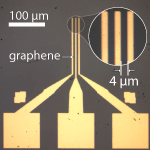 This implies a performance that is competitive with the best room-temperature terahertz detectors for an optimally coupled device, and time-resolved measurements indicate that our graphene detector is eight to nine orders of magnitude faster than those. A simple model of the response, including contact asymmetries (resistance, work function and Fermi-energy pinning) reproduces the qualitative features of the data, and indicates that orders-of-magnitude sensitivity improvements are possible.